Not so very long ago, many internet critics of christianity were pointing out that there was no archaeological evidence of settlements at Bethlehem and Nazareth in the first century. This demonstrates, they said, despite the fact that few scholars agreed with them, that these towns didn’t exist, and that therefore the Bible accounts are not historical. But three years later the situation has changed. Until a few years ago, the only archaeological evidence for Nazareth amounted to little more than the remains of a winepress, a few tombs and a few artefacts. 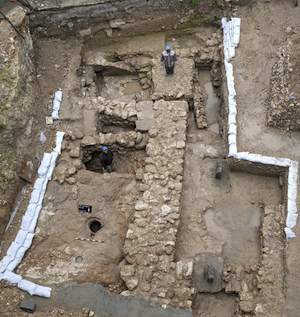 However in December 2009, the Israel Antiquities Authority issued a press release announcing that a house in Nazareth (see photo above) had now been excavated and had been found to contain artefacts from the “early Roman period” (first and second centuries). The archaeologists also found a pit hewn out of stone with a concealed entrance, which they believe was constructed as protection during the Jewish revolt of 67 CE. This was seen by the Authority and others (The Guardian and the Huffington Post) as conclusive evidence that Nazareth did indeed exist in the first century. Based on the number of tombs found previously, they conclude that it was a small hamlet of about 50 houses. Those who believe Nazareth didn’t exist have adjusted to this evidence, and tend to denigrate it as “sensationalist” (Nazareth: the town that theology built), or argue that the evidence doesn’t relate to the exact period of Jesus’ life, but several decades later (nazarethmyth.info). Nevertheless, scholars, who generally didn’t doubt that Nazareth existed as a small village, have been reinforced in their conclusions. There was even less archaeological evidence for Bethlehem – virtually nothing before the fourth century – giving sceptics even more basis for their arguments that this showed the unreliability of the New Testament. But that has changed slightly in the past few weeks. Recently the Israel Antiquities Authority announced that archaeologists working in the city of David area of Jerusalem had discovered a small (1.5 cm) ‘bulla’ (see photo), a piece of clay used to make an impression in wax, sealing a document so it couldn’t be altered. 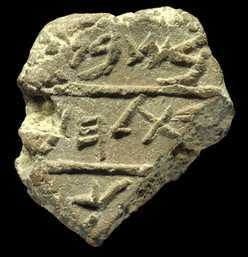 This small bulla apparently accompanied a delivery of goods to the king of Judah about 7 centuries BCE, and identifies that the shipment was despatched from Bethlehem. This shows the existence of town named Bethlehem seven centuries before Jesus, the first independent corroboration of the Bible’s references to the town. This doesn’t prove it existed in Jesus’ day also, but if it was there 700 years before and 400 years afterwards, it suggests that it probably did indeed exist at the time of Jesus (see report in the Los Angeles Times). Scholars say that only a very small fraction of the artefacts of the time have ever been discovered, and no-one knows what discoveries are yet to come. This makes perilous any argument that a place doesn’t exist based on the lack of finds, and most scholars are cautious about making such claims.